10 million new millionaires will be created in the next few years — all by doing ONE THING. Here is how you make sure you are one of them. If you've ever imagined starting your own business, or have already started one, this email is for you. I honestly believe that what I'm about to tell you could end up being a major turning point in your life. How do I start a new business, and once started, how do I quickly make it profitable? Well, that’s what this email is all about. I'm going to share with you a solution to both of these entrepreneurial challenges. First, I want to explain to you why world-renowned economist (and multimillionaire entrepreneur) Paul Zane Pilzer is calling the time we're in right now... The dawn of the "Entrepreneurial Golden Age." It's because, despite what the media are telling you, corporations are NOT laying off people in droves because of the bad economic times. People are being let go because of the technology shift. It's what economists call "structural unemployment." A newer, better method comes along, and people get pink slips. But companies still keep the output of their labor... either in a better method... a better organization chart... or a better machine. Today's business environment is screaming out for innovative ways of doing things. The world is looking for new, faster, easier, and more effective ways to improve the quality of life we live and to make more profit. Responding to these new needs can be tough, even impossible, for a big, bulky, encumbered corporation — or even for a small business structured along outdated corporate models (which most are). But for a lean, nimble, unfettered entrepreneur whose business is structured for the NEW economic order, it's so much easier. You can monitor the changing needs of the market and quickly identify and present the product or service that will meet them. As new market demands emerge, you'll be free to immediately adapt your business to them, or even start an entirely new business built around them! If you can identify a product or service that will help other businesses keep output and profits up while keeping overhead and transaction costs down — if YOU can provide the "newer/faster/better" solution everyone's looking for — then you will be in an excellent position to thrive, prosper, and grow in this or in ANY economy. Paul Zane Pilzer is one of the most fascinating economists of our time, and one of the most widely respected business minds out there. Major players, from Sam Walton, the founder of Wal-Mart, to Anthony Robbins have personally relied on his money advice and solid business genius. Paul made his first million early in his 20s... was an economic adviser to two presidents of the United States... has taught at one of the most prestigious universities in the country... is the author of nine bestselling books on the economy... and has been regularly quoted and featured on the front pages in publications such as The Wall Street Journal, The Economist, and The New York Times. He is also an extraordinarily successful entrepreneur. In fact, Paul has started, financed, or helped run more than 21 different businesses in the past 15 years alone. That's more than most people do in a lifetime! In other words, he's an indisputable expert on the theoretical side of business and money... AND on the practical, nitty-gritty, nuts and bolts reality. He knows how both work. He knows how to put them together. Tell you EXACTLY HOW you need to do it. It's called The Entrepreneurial Challenge. And it's going to help you make your dreams of profitable, thriving, fulfilling entrepreneurship a reality. The Entrepreneurial Challenge is unlike anything we've ever done here at Nightingale-Conant. This program is designed to help you discover the very best business for YOU, and then help you successfully start it and run it profitably... without losing an ounce of your personal freedom. Actually, it makes life more rewarding, brings greater satisfaction, and expands your lifestyle. That's because Paul will teach you how to start your first business or grow your current one based on "what you know" and "who you know" — versus starting over in a new and unknown field. And so much more... everything you need to fully participate in the coming "Entrepreneurial Golden Age." Yes! I want the secrets to building and growing a profitable business. I’m ready to order The Entrepreneurial Challenge at 75% off (limited-time offer). Paul is not interested in the traditional "millionaire" business model, where you start off small and grow yourself a massive ball and chain, complete with tons of employees, massive overheads, and stifling transaction costs. That model is dying and will soon be no more. No, I'm talking about a lean, robust, hyper-efficient business engine that will not only give you the wealth you're looking for, but the freedom that you haven't found yet. Paul's complete take on why the Crash of '08 is part of the "cure" and not the "illness"
"The 10 Best Businesses You Can Start RIGHT NOW"
The Entrepreneurial Challenge also includes two incredible sessions in which Paul reveals the 10 easy-to-launch businesses that hold the greatest potential for profitability and growth right now. Paul will lead you through all the details and business plans on how you can make any of these profitable. Each business can be started rapidly. Each is innovative. Each is unique. Each has a minimum annual profit potential of $500,000... some much, much more than that. These businesses not only have the potential to make you wealthy, they are totally geared around social entrepreneurship — solving a social problem to make people 's lives better. Even if one of these 10 businesses doesn't appeal to you, then you'll know exactly how to spot other perfect business opportunities that fit you better personally. Paul will give you just about every detail you need to get started. I have never, ever seen any other program that gives you this kind of business idea detail... let alone 10 of them. in the making right now. As someone with the entrepreneurial drive running through your veins, there's absolutely no better time than right now to start your new entrepreneurial venture... or to kick into high gear the one you've already started. When most everyone else is still trying to find the "perfect job" inside of Corporate America, you can be taking action and living life on your own terms. Right now, you can be setting the foundation for a new life, full of happiness, freedom, and wealth. Plus, I can't think of a more rewarding and satisfying life than making the world a better place to live by putting Paul's revolutionary "Social Entrepreneurship" to use right now. You'll definitely become wealthy along the way. And by "wealthy," you know I mean more than just money... that will happen naturally as you succeed. There has literally never been a better time. The window is open right now. But who knows what the future will hold? So take action now. Begin your new life with Paul's world-class counsel, insights, secrets, and wisdom. P.S. The Entrepreneurial Challenge also includes a fantastic BONUS CD featuring two powerhouse sessions: "Professor Pilzer's Crash Course On The Current Economic Crisis"... and "Entrepreneur Pilzer's Lessons From The School Of Hard Knocks". Few people have as thorough an understanding of both the forces that shape larger economic events AND the in-the-trenches reality of actual business ownership as Paul does. In this must-listen CD, he imparts his one-of-a-kind wisdom to you. This bonus CD is a MUST-LISTEN if you're serious about making it as an entrepreneur, and it's yours when you order today — so click on the link below now, and find out if you'll be one of the next decade's newly minted millionaires! YES! I'm ready to grow a business built around the new economic order so that I can quickly start living life on my terms as a millionaire entrepreneur! 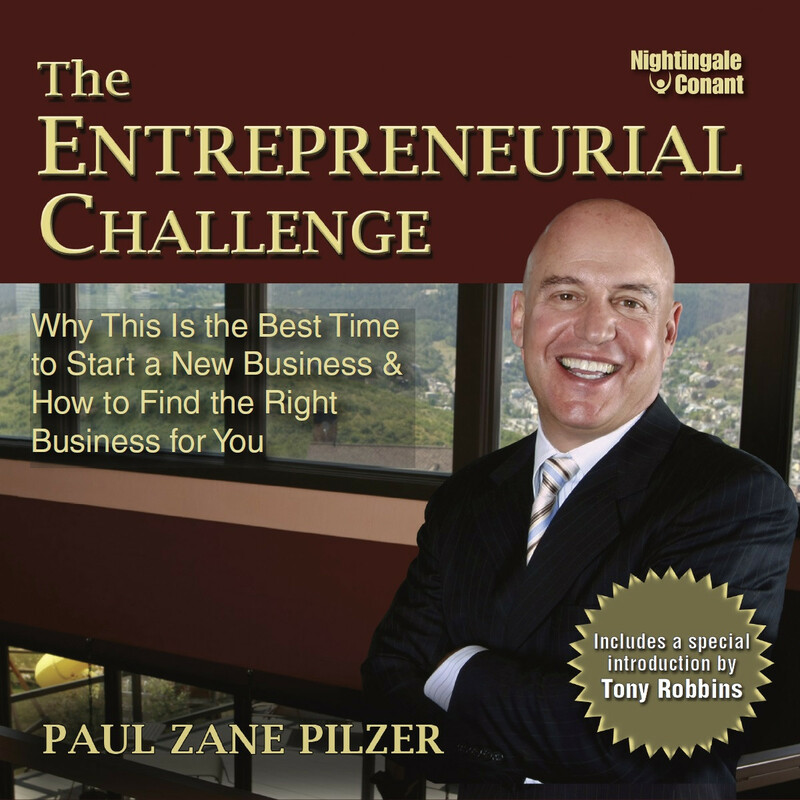 Please send me Paul Zane Pilzer's eye-opening audio course The Entrepreneurial Challenge — I can select one of two ways of ordering.